I hope everyone had an amazing Holiday! Our holiday started with Michael having a Varsity game Thanksgiving Eve. I didn’t do much prep work the day before. However, I woke up early to cook dinner, which I was really pleased with myself because everything was ready before 1:30pm. I made small portions of some of my family favorites. I didn’t make a lot of desserts. Just pumpkin pies, and banana pudding. I want to know more about the best chicken ever. It sounds like you have some great meals planned. All of these sound really good. You and yours really eat well! 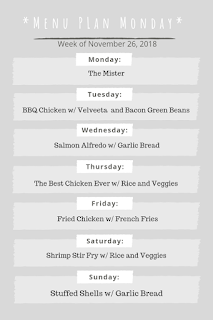 I've recently started meal planning as well, and it saves sooo much time. Thanksgiving was a bit sad for me. It snowed so hard that my family couldn't travel so we missed out. No Thanksgiving for us. That shrimp stir fry is calling my name. I need some good seafood this week and it sounds so delicious. You always give me such good ideas for things to do each week. I hope you have a delicious meal every night. I just bought some salmon and that salmon Alfredo sounds awesome. Thanks for the inspiration! I know what to make now. All of this looks so tasty! 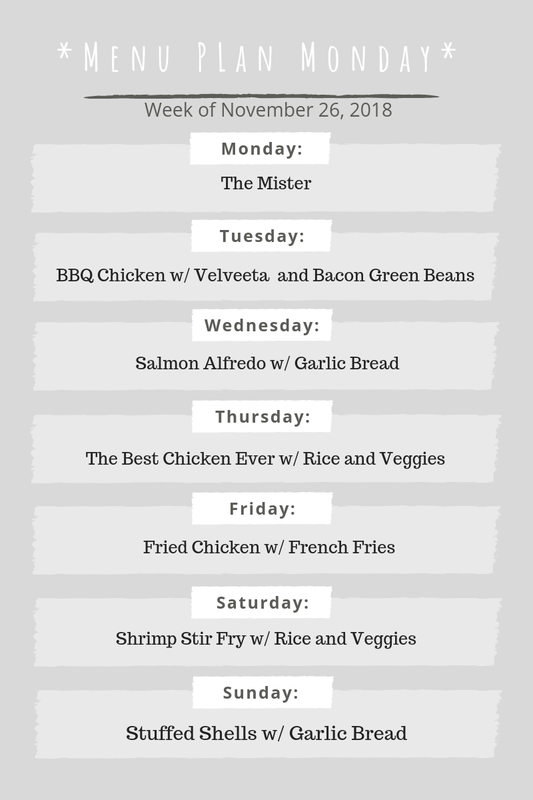 I sort of made a meal plan for this week. I had a good Thanksgiving! We went to my mom and dad's and pigged out. I am in awe of your organization! This is such a great way to start the week and help with shopping and prep work, not to mention setting expectations! Maybe in the New Year I'll get my act together! We had fajitas tonight. SLow cooker beef stew is on the menu for tomorrow night. I am terrible at planning meals! These are great ideas and also easy enough for me to put together. It's nice to plan out the week ahead of time so I'm not making a million trips to the store. Your Sunday menu got me thinking.... for my kids and hubby ... The Saturday menu is all for me lol. Salmon is my favorite i would probaby partner it with steamed brocolli and cauliflower rice. I like making list of menue each week it save my time. These menu looks really nice and delicious food. I am not that good at making menu, only does for holidays. Rest of the days I try to make whatever possible at that time.